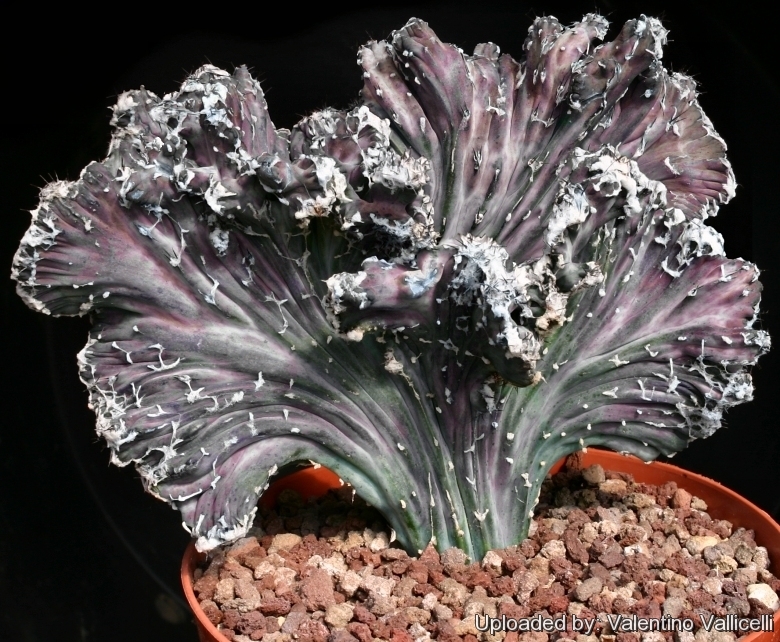 This easy to grow plant is very attractive because of its spectacular purple-blue stems with pronounced sculpture effects. 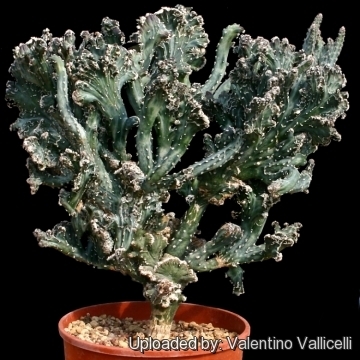 There also a similar crested form with blue-green marbled stems. 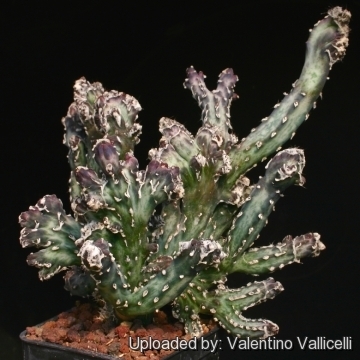 Description: The typical Monvillea spegazzinii is a fast-growing slender shrubby cactus that has bluish stems that creep along the ground to form a shrub. 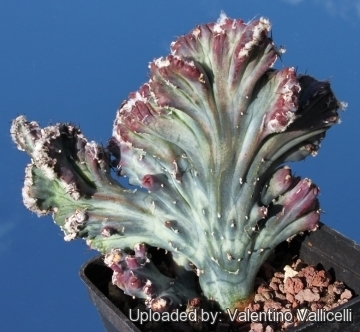 There are two similar but slightly different crested forms that are now widely cultivated for their beautiful stem with pronounced sculpture effects. Stems: Bluish-green that tinge purplish in full sun up to 25 cm tall and wide. Roots: Tuberose and succulent, Even adventitious roots of Monvillea spegazzinii become succulent. Flowers: 10 to 13 cm in length with a slender tube, reddish outer perianth segments and white inner ones. They arise from near the top on the sides of the stems; buds point upward but curve suddenly downward when the flowers open. They bloom at night. 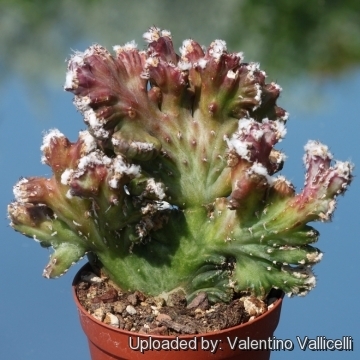 Remarks: These plants produce monstrous crests, and crests occasionally produce normal shoots. Cereus spegazzinii F.A.C.Weber: (Monvillea) Slender shrubby cactus that puts forth many basal purplish mottled shoots, soon becoming tillered. Flowers, nocturnal, 10 to 13 cm in length with a slender tube, reddish and white. 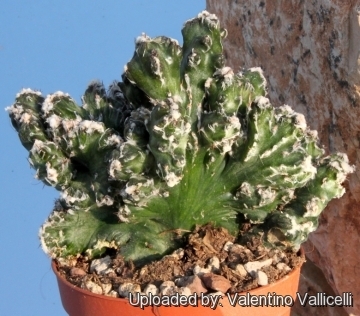 Cereus spegazzinii f. cristatus monstruosus hort. : Produces marbled montrous crests that tinge purplish in full sun. Cereus spegazzinii f. cristatus hort. 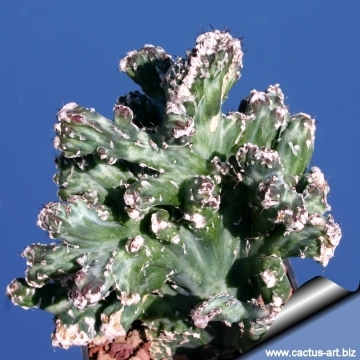 : Produces crested form with blue-green marbled stems.